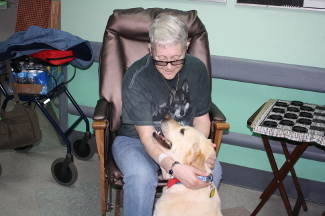 In 2009, Tori and Anne obtained the Therapy Dog International (TDI) certification which allows an individual to take a dog into various medical, nursing and assisted living homes or schools, in order to share the love and therapy of dog visitations. The individuals and residents of these settings have not had the opportunity to keep their treasured dogs or to have continued contact with them, and it provides an opportunity for them to be able to do so. Also, therapy dogs go into schools so children can read to them with confidence. Little did I know how very rewarding taking our dogs for therapy dog work would be. We visit the Hospice House of Randolph County two days a week, as well as visiting at a nursing home and making special visits to individual patients. 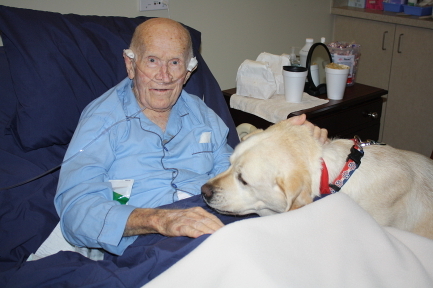 Kota and Millie are certified Therapy Dogs and are always excited to make visits and share their unconditional love. 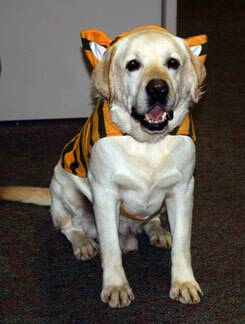 They enjoy being ‘dressed up’ and always bring a smile to the patient or the family. There is no way that we can express how very rewarding it is to have our Labs serving in this role. We will continue to certify other Duckback Labs and continue this service for a long time.